This ad from the Manhattan White Pages, 1942, proclaims "Your Favorite Furriers For 3 Generations Canadian Fur Corporation." A short obituary in the New York Times, 7 Dec. 1929, p. 16, credits Charles Dornfeld with having "founded the Canadian Fur Company ten years ago" - i.e., 1919. The 1919 date seems a little early, although the company may have existed in Canada before opening in New York. The earliest reference I have been able to find to Canadian Furriers (known at the time as Canadian Fur Trappers Corp.) is a listing in the Manhattan telephone directory for 1922: "Canadian Fur Trappers Corp 72 W 125 Harlem-9192." Canadian Fur Trappers was an enterprise of the Dornfeld clan, of which the pater familias was Louis Dornfeld (born Austria ca. 1863, immigrated 1896). The Dornfelds came from Borislav / Boryslaw / Borislaw, Galicia (now located in the western part of the Ukraine). Louis Dornfeld's wife, Pauline Dornfeld, is listed on the ship's manifest of the Fürst Bismark sailing from Hamburg 3 Nov. 1898 to New York. With her are 4 sons: Jacob, Harry, Samuel and Nathan. Louis Dornfeld was a grocer, and he appears in the U. S. Census of 1910 living on East Houston St. with wife, Pauline, and 6 sons. The sons, ages 26 to 10, were also born in Austria with the exception of the youngest, Morris, 10, born New York. The eldest son is Charles Dornfeld, age 26, whose occupation is Cigar Maker. This is Charles Philip Dornfeld (1884-1929), credited with founding Canadian Furriers. He registered for the World War I draft in 1918 as a Furrier employed at 391 Grand [St.] NY NY. The business at 391 Grand St. was called the London Fur Co., which was a partnership between Charles Dornfeld & Nathan Wissner. Other sons connected with Canadian Furriers included Jacob Dornfeld (1887-1974). Jacob Dornfeld was still employed as a grocer at the time of the U. S. Census of 1920 (the grocery was located at 868 First Ave. (near 49th St.)). Harry Dornfeld (1890-1978) gave his occupation as wholesale grocer in 1920. He roomed at the home of Abraham Reinwand at 185 South 2nd St., Brooklyn, as did his younger brother, Morris. Samuel Dornfeld (1893-1961) registered for the World War I draft in 1917 when employed at Levy & Nathan, a clothing manufacturer located on Fifth Ave. There was also a Nathan Dornfeld (1896-?). In 1917 Nathan Dornfeld lived on Rivington St. and ran a grocery store at 535 E. 17th St. By the time of the 1920 U. S. Census Nathan Dornfeld gave his occupation as Proprietor Fur Store. The youngest brother was Morris Dornfeld (1899?-1976). In 1920 Morris Dornfeld roomed in Brooklyn, as did his older brother Harry Dornfeld. Both brothers gave their occupations as Wholesale Grocer. The 1933/34 issue of Polk's New York City Directory gives the following lineup of officers at Canadian Fur Trappers Corp.: Nathan Dornfeld, president; Samuel Dornfeld, vice-president; Jacob Dornfeld, secretary; Morris Dornfeld, treasurer. The company was also known as Dornfeld Bros. and was located at 156-160 W. 34th St. from approx. 1925 to 1987. Apparently there was a retail store as well as offices and a fur storage unit at this address. 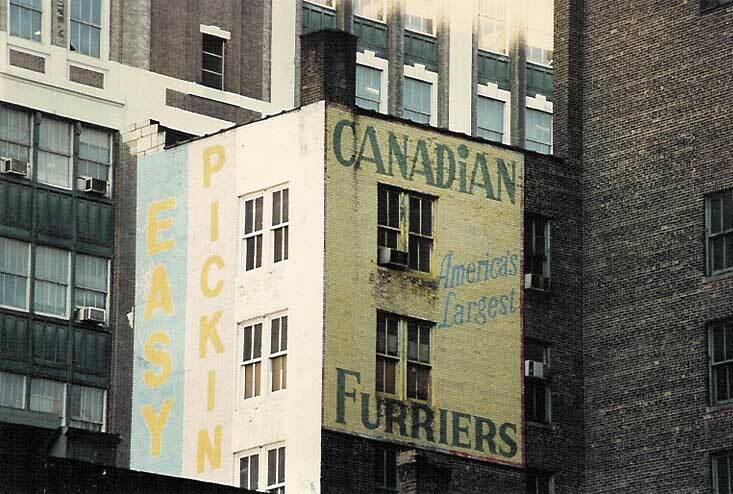 A view (dated 1951) of the east wall of 160 W. 34th St. with signs reading Canadian Fur Inc / Furriers for Three Generations can be found on the New York Public Library's Digital Collections. Another view, also in NYPL's Digital Collections, shows the west wall in 1951 where the sign read Canadian / Fur Inc / One of / America's / Great / Furriers. This view also shows a Canadian / Fur sign over the entrance at the front of the building.